Part 4.2 of a series of conversations with people who are driving profound changes in the way that we are able to sail. Once the opportunities are clear, how will people choose to sail? Negative Lift is what you get from a vertically-sectioned wing, using a lower portion to drive the boat forward (also generating sideways and heeling forces) while a contra-shaped upper portion counters that force, lifting the boat back toward its upside. “The BMOR wing can produce negative lift by moving the upper flaps in a reverse direction, but because their leading structural wing section is a single unit from bottom to top, this produces a proportionately small effect and creates drag. This is, however, a simple way for them to affect heeling moments. The practicality and utility of negative lift are good for debate in any gathering of engineers. Might negative lift induce so much drag that you wouldn’t use it for speed to weather, but rather crank it up to reduce power for a hairy mark turn in a breeze? And if it works say, Hallelujah! Meaning a wing 190 feet high, almost identical to the total wingspan of a Boeing 747 (two wings and a fuselage). Yes, the boat could sail under the Golden Gate Bridge, with an inkie-winkie to spare. Data sensors are critical to both Harbor Wing and BMOR. Larry Ellison’s giant tri has sensors taking pressure readings at 26,000 data points per second. Can Unit G take more load? Is Unit R on the edge of failure? 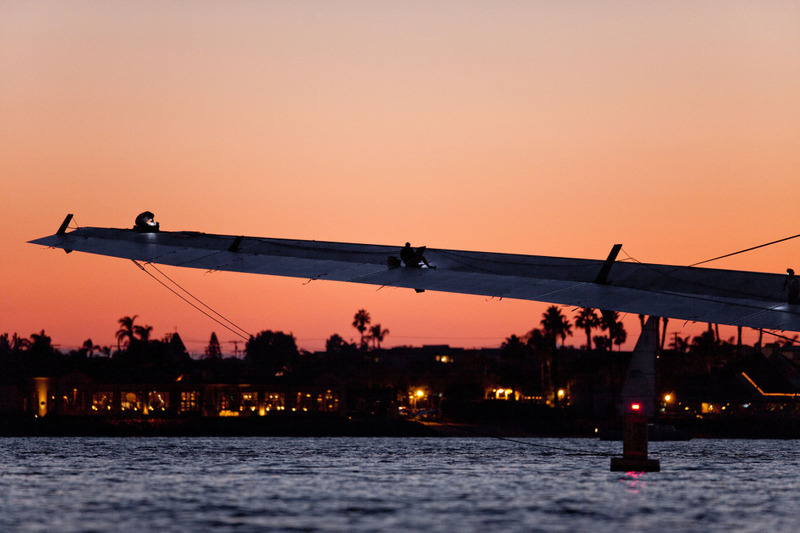 The team claims that in failures during the work-up in San Diego, the multi-element nature of the wing proved invaluable. That is, stuff broke but never the whole thing. So yes, the wing is the challenger setup for AC 33. But, as backup, it was a no-brainer to load the soft-sail rigs onto the ship that carried boat and wing to Valencia. 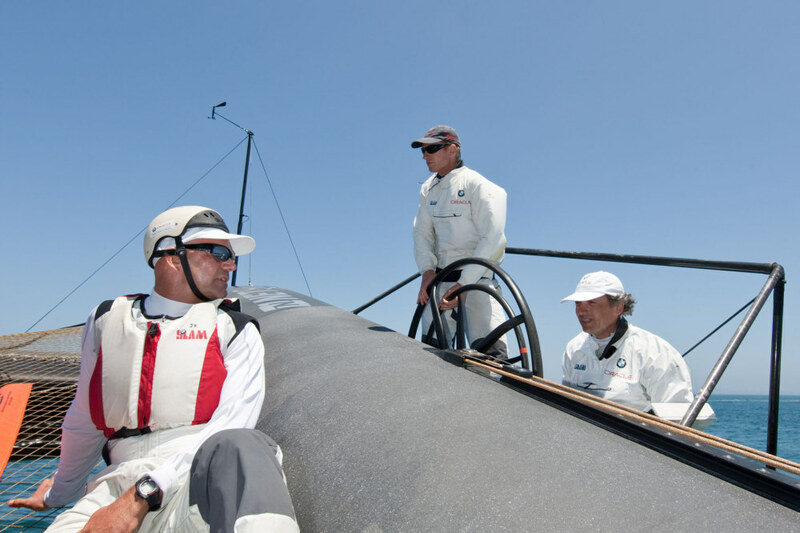 John Kostecki, tactician, foreground, with James Spithill at the wheel. And as for that wing, well, it’s a small design world, with fewer than six degrees of separation. Part of the BMOR design team (naturally, would they leave a stone unturned?) 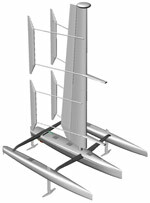 is David Hubbard, the same David Hubbard that Mark Ott mentioned above, who also is part of the team at Harbor Wing, which gives his bio thus: Mr. Hubbard developed the first slotted full airfoil airplane style wing for a sail craft in 1965 and won the Little America’s Cup four times with its evolution. In 1982, his Red Herring became the world’s first modern version of the canting keel, and in 1988 he designed and built the wing sail for Dennis Conner’s winning America’s Cup catamaran, Stars & Stripes. For the BMOR wing, Drummond says, “I think we’ve done a good job of figuring out the three-dimensional pressure interactions. Even if we did it again tomorrow we wouldn’t change much. So far the team’s predictions have been bloody good. Most of what we’ve tested has scaled up well, and where the numbers didn’t fit, something scaled up in a positive sense. It takes an authentic wing geek to be aware of U.S. patent No.3, 332, 383, which arguably solved the camber variables of a wing sail at the mechanical level, but in a time when the available materials would have made the wing prohibitively heavy. Carbon is the key to the hotrod boats of our moment, but not necessarily of the future. “New materials let us improve on old ideas,” Drummond says. “The future comes back to structure. If Nathaniel Herreshoff was around today he probably would produce boats as fast as these. I have to hand it to Herreshoff’s yard, to the people who built Reliance at 143 feet for the 1903 Cup. In many cases they used materials that had not been around very long. Like us, their desire for performance led them to accept a short-term boat. OK, the conversations in this series have several times turned on efforts to automate sailing, a subject sure to inspire a few and offend many. Any Mike Drummond thoughts on that?